Opened in 2011, the restaurant of the Opera Garnier is located where the horse-drawn carriages used to drop off their passengers, coming for a performance. They say the design is modern but it reminds me of the seventies. This white soft cloud formation, floating above the guests like a phantom is disturbing me. I am seated underneath in a confortable red chair wondering what the architect was thinking when she got this idea of an undulating mezzanine with such protean curves. The assassination attempt on Napoleon III by Felice Orsini in 1858 outside the Opera House on Le Peletier Street acts as a trigger for the emperor to launch an architectural design competition for a new Opera House in Paris. 171 plans are competing. The selection of Charles Garnier’s project came as a surprise. The young architect ousts both the empress’s favorite architect and the one who built the original Opera. Charles Garnier is relatively unknown and does not know much about acoustic matters but his design impresses for its strongly defined spaces, its stunning polychrome and the abundance of Italian references. Cherry on the cake, a secure and direct entrance is built for the Emperor. The architect Garnier had originally planned to install a restaurant in the Opera House but for budgetary reasons, he was not able to complete it. I wonder what he would have thought of the current design. The Opera is as well a classic French dessert made of layers of almond sponge cake known as Joconde Biscuit and soaked in coffee syrup, layered with chocolate ganache and coffee buttercream. The paternity of this cake is unclear. Paul Bugat from the Clichy Pastry shop invented the Opera under the name Clichy in 1920. Then in 1955 Cyriaque Gavillon, pastry chef at the French pastry house Dalloyau, claimed the creation of the cake named by his wife after the Opera Garnier stage or maybe after the ballerinas, regularly customers at the pastry shop. In the sixties Gaston Lenotre contested the paternity of the Opera. 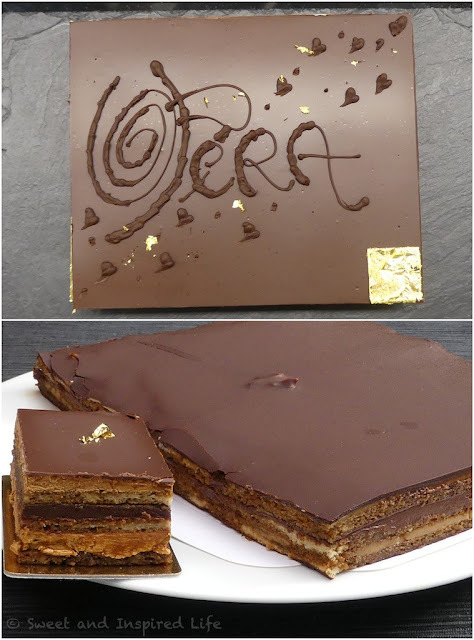 Back to my plate… I am curious to try the Revisited Opera cake by the Pastry Chef of the Opera Garnier. Study case: The additional caramel thin layer is a nice find but it is overpowered by the strong flavor of the coffee butter cream. I think this modern Opera is too heavy. Maybe because it is missing a layer of Joconde biscuit… The classical Opera has three layers of Joconde biscuit. I have bad memories of the Opera I baked at school. I messed up the coffee butter cream. My batter was still too hot when I incorporated the butter and so… took a disastrous turn. Oui, merde! Dawn, I'm not running for Masterchef!... And the background finally shouted: Time's up! And forget about the chocolate writing. Messed up or messed up, I choose the Queen’s highway. And, I submitted a flat and naked Opera. Oui, not very proud! However Charles Garnier was very proud of his project and specially the majestic staircase of marble, which divides into two divergent stairs that both lead to the Grand Foyer. The Grand Foyer is like the Hall of Mirrors at the Palace of Versailles. A lot of gold and a lot of mirrors. People come to the Opera Garnier not so much for the performance but to watch people and to be seen. And the seats in the private box of the Emperor are the best seats to watch people but the worst seats to enjoy the show. Started in 1871, the construction of the Opera Garnier lasted for 14 years and the inauguration took place in 1875 after the fall of the empire. Napoleon III passed in exile, in England and never got the chance to enjoy the Opera House. Aside from the big Story there are as well the little stories. 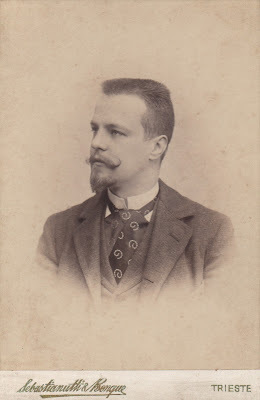 My grand grand grand father Franz Benque (1841-1921) opened his first photography studio in the old town of Trieste, Italy in 1864 along with his father in law Guglielmo Sebastianutti (1825-1881). My grand grand grand uncle Wilhelm Benque (1843-1903) was the wild one, leading the unsettled life of a globe-trotter in Europe and Asia. The history of the photo-house covered four generations of photographers within the family as Franz’s son, Albert (1873-1953) and his granddaughter Lilly (1913-1999) worked as well in the family business. They worked in Europe, South America and Asia and, participated to international photo exhibitions.